The Marker Hotel located in one of the most vibrant cultural hubs of Dublin city – Grand Canal Square – is an urban retreat for those who crave the unconventional. A member of the prestigious Leading Hotels of the World®, you can expect first class standards of service from the moment you step on site. 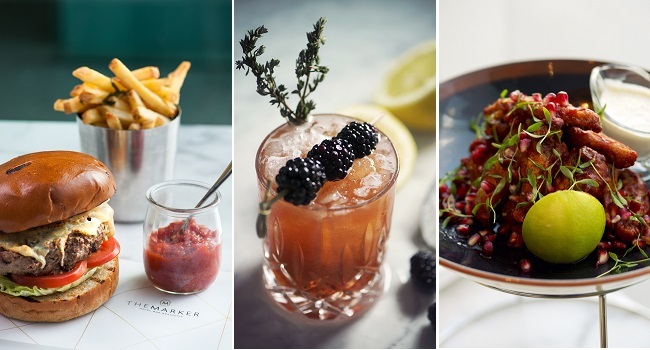 The Brasserie at The Marker Hotel is delighted to host Le Drunch each Sunday from 2pm – 5pm. A hybrid between lunch and dinner, Le Drunch is the perfect way to share delicious dishes, retro desserts and to grab a cocktail (or two!) with a group of friends. To keep the fun vibe alive we have our in-house DJ spinning some laid back, ambient music. Executive chef, Gareth Mullins has put together an incredibly moreish menu that will transform your Sunday and put Le Drunch at The Brasserie at the centre of your Sunday ritual. The menu includes a variety of the good stuff, the comforting stuff, the pick me ups, we warn you making a decision will not be easy! The Le Drunch drinks menu includes the classic Bloody Mary cocktail, Bellini’s, and Mojito’s. Le Drunch is the perfect way to while away a lazy Sunday afternoon, whether it is with a group of friends or just the two of you, The Brasserie has open spaces and private booths so all you need to do is book. The offer includes a sharing starter, a main course and a sharing dessert and is available exclusively to TheTaste readers for €45 for two people.